Just about ten more weeks (or so) until Liam makes his grand entrance into the world. I can't believe it. Our sweet boy will be here before we know it. I had my 30 week midwife appointment and she said everything with Liam is just perfect. He's in the 58th percentile for growth and his heartbeat is steady. And I'm at 135 pounds now so she said I'm doing great with my weight gain. The only bad thing I discovered this week were....stretch marks. They're small, not very noticeable at the moment, but they're there. *sigh* Oh well, it's a small price to pay for a healthy baby boy. 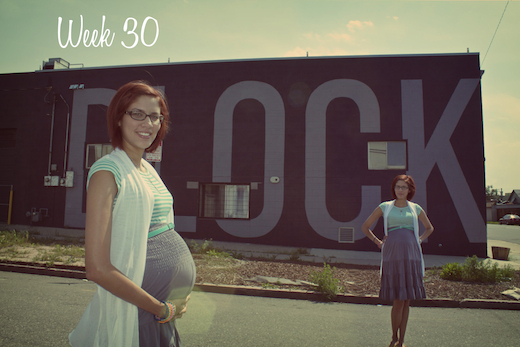 For this week's photo we went to the intersection of Larimer and 30th, to the Block Building. This is where our church has been meeting. It's such a great space. It used to be an art gallery and is now an architecture firm with an event space that they rent out on the weekends. It's right in the heart of the RiNo Art District. I love that we get to have our gatherings here every Sunday night. Our church has really been blessed. If you're in Denver you should definitely come check us out.